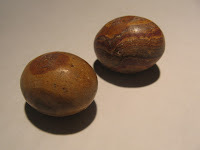 When you place them between 2 fingers and shake them individually, they both have something inside that wiggles, (another stone inside) these small stones grew inside these twin stones. Also when you put them close to each other, you will see that they begin to vibrate and move toward one another by themselves, these stones are alive, and have a powerful magnetic power. 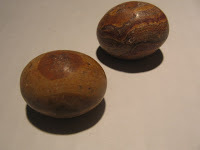 I have never come across stones like these before, they have a large energy/aura about them, bring luck, magnetism, wealth, power and protection to the owner, and open paths of opportunity for its possessor. 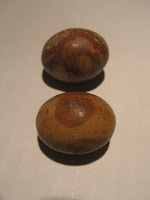 These are the only 2 Twin stones that I possess and have come across, I possess many such metaphysical treasures, and others that find their way to me, I believe that I am to find their homes and distribute them throughout the world in this time of great change. 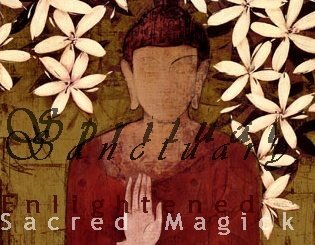 Rare and magickal item!